I was almost ready to dismiss this stick on light as a lame product, until I thought about all the times that I squint to see the buttons on my TV remote controls. Hmmmm… it might look a bit dorky, but it could actually come in handy. 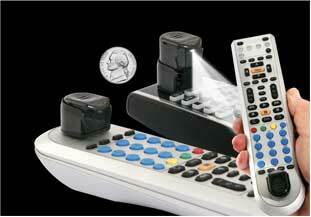 The Pop-up Microlite is a nickel sized stick on LED light for your non-backlit remotes. Stick it on using the 3M adhesive and then press it so it pops up to illuminate the buttons. When you’re finished with it, press it back down to turn off the light. You can buy one for $9.99 or a set of three for $19.99. To tell the truth, I’m dreaming of remote voice control of my TV. I know the there some experimental models, but it is not so wide spread yet. And with voice control you won’t have to seek a necessary button. ))) Well, still it is possible to control your self phone by speaking. Who cares what it looks like when you have eye problems like me and everyone in my fam! I’ve needed this for years! I tried an expensive universal remote with backlighting but you still couldn’t read the text on the remote and I had to get my nephew to program the darn thing. I ordered this microlite, will provide feedback when I get it, thanks for the link…..
@Jen I look forward to hearing what you think! Right Fix, for Right Situation, for Right person. Can’t Fault that at all. Glad to hear Jen. Remember to send it back when you’re done.